"a smart transportation system equal to the needs of the 21st century. Reduces travel times and increases mobility." Later he talked about how this is not something of the future, it is happen. Just not in the USA. His plan includes high-speed rail service from Vancouver, BC to Seattle, WA if we let it. We have reported last week about the red tape offered from the Canadian Border Services Agency (CBSA) and processing of passengers after their normal business hours. Global BC reported last night that for the sake of $1,800 to provide the processing, we are giving up hundreds of thousands of dollars in tourist spending in Vancouver. Global also discussed a $3M siding that the BC government paid for to make passenger service more viable on this rail line and help AMTRAK avoid freight train conflicts. I was happy to see our friends at Transport 2000 BC were interviewed on Global's News Hour Final. As of this writing a video link was not available. We are very pleased to see Transport 2000 take the lead on this rail corridor, as passenger rail and sustainable transportation takes many forms and we can't focus on all of them at all times. Thank you Transport 2000 BC! You can watch the ABC News coverage of the President's announcement here. You can also read more here. 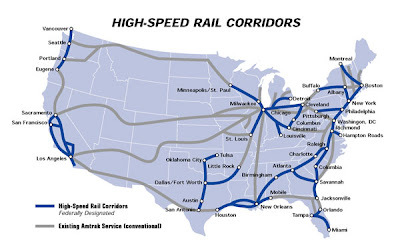 All this as American's thirst for more rail service increases. The Vancouver Sun's special Transit-Spotting found here. Cushioned walking paths for Vancouver? New Port Mann Bridge will be finsihed by the end of 2012 - One full year earlier! Vandals believed to be two young females, busted up ticket and validation machines at three SkyTrain stations. The story and picture appears here. They caused over $5,000 in damages. We hope that Chief Ward Clapham and his transit police find these two and make examples of them. BC Carbon Tax: Finally, Tzeporah Berman, a well-known environmentalist and long-time NDP supporter told the party this week that she feels "deeply betrayed" and said, "You have put politicking before the planet in the most hypocritical fashion". Berman was referring to NDP statements this week that they would scrap the BC Carbon Tax that was implemented by the BC Liberals. Just reporting the facts here without being partisan. For the record, both Nathan and I support the carbon tax, and we personally favour two different political parties. The NDP is so desperate that they're willing to say anything to get elected. The current carbon tax may or may not be a good thing, but some sort of tax on greenhouse gases is going to be necessary if there's going to be much of a world for my children to pass on to theirs. The current tax, 2.4 cents per litre, is a complete joke. It won't change behavior until it's at least 10 times that much and until the money collected goes straight into alternatives. For all their good intentions I'm not sure I can even trust the Green party to put carbon tax revenue into meaningful projects without some of it finding its way into the hands of supporters. It simply takes too much money to get elected these days for politicians to be free of such indebtedness once in office. Given the track record of the alternatives, however, I'm definitely voting Green this time.